Kanazawa Ashigaru Museum (金沢足軽資料館) includes two remaining Ashigaru Houses of Kaga Domain. They were built in Edo Period and used until 1990's. Ashigaru is the lowest class of Samurai which has 10 to 25 koku of rice. These remaining houses represent the life of Ashigaru in Edo Period. Although the Kaga Ashigaru were few in number, they lived in one-door buildings that included a garden. Ashigaru house like this took the form of something like what today is a housing complex. By visiting these Ashigaru houses, you can sense that the Ashigaru obeyed their roles and duties. Ashigaru, form the time of Kamakura Period, were essential during group battle. During the peaceful Edo Period and reconstruction, the number of Ashigaru was limited. Still, the smal number of people that were placed in this very lowest of the military classes, spent very busy days. In the Takanishi House, the history of Ashigaru, along the four themes of "organization, lifestyle, residence and house," is explained. The rooms of Ashigaru House are layed out in two rows: the reception space from the front door to the guest room, and the living spaces, which is from the sink, dinning, closet living room and kitchen. Here Ashigaru led a simple life using only the everyday living space. In the Shimizu House, there are displays of restored items used in each room, you can get an idea of the kind of the family. 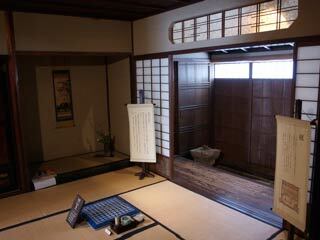 A part of the Shimizu house shows the public literature materials that have a connection to the Ashigaru. Here the exhibits are on four themes of "duty, military arts, ancestry, and culture/education."